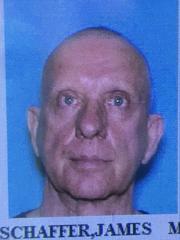 Missing Person: James Schaffer W/M/65 short gray hair, jeans and a gray t-shirt riding a black bicycle; last seen on Rt 70 near Plymouth. Call 911 if sighted. Call 911 if sighted and please try to keep him in sight.